Well, the 'Sup's sunrise carpet is going to be more colourful at this year's Meredith than ever before... Yes, another day, another Aussie craft brewer with a beer in can, as Mr East Coast Canning continues to wear ruts into the roads between Brisbane and Melbourne. Yet, when the results are as colourful as this first KAIJU! can, bring 'em on! Provided they don't attract the ire of the makers of Candy Crush like they did the lawyers employed by Monster energy drink in their first guise, one assumes that you'll be seeing fair bit of KAIJU! Krush around. 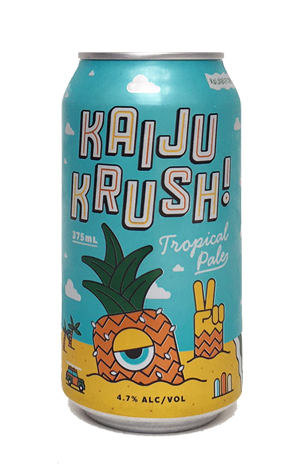 It hit stores on the day we'd pulled together our panel to pick the best new Victorian releases of 2016 and there were a couple in the room arguing that this tropical pale ale warranted a spot in the ten. Some might argue it's not a particularly KAIJU! beer; there will be people out there who assumed the Melbourne operators would always operate in the higher realms of booziness, with Robohop being their one concession yet still weighing in above 5.5 per cent ABV. On the other hand, if there's anything that the brothers Reeve have claimed as their dominant calling card above all others, it's hops – and Krush is awash with them, filling the can with juicy, summery vibes and a bitterness that might not come at you with the potency of their other beers yet is still most definitely present. Add in more fantastic artwork from Mikey Burton (best Aussie can design to date?) and it's a pretty sweet package, expected or otherwise.